I am not going to lie, I do not clean my makeup supplies as often as I should. In between work and school, it seems to be an element lost on my to-do list. With spring cleaning in full effect though I thought it best to sit down and find out just why cleaning beauty supplies are so important (and actually clean them as well). According to good housekeeping.com not washing your makeup supplies can do more than just make your face or hair look bad. By not cleaning your makeup brushes you can cause skin break outs. with built up product on the brushes, it can cause bacteria growth or even staph infection. This goes more makeup tools as well. When you do not clean your eyelash curler it can cause beauty no-no’s like loss of eyelashes or eyelash clumping. By not washing or changing your makeup sponge, it could even attract bugs because of the warm wet environment it creates. If you needed another reason to always wash your beauty supplies it is this! Also, by not recycling your makeup sponge, it can cause makeup getting backed up inside the sponge. The next item that you should put on your wash list is hairbrushes. According to an interview of Francesca Fusco, a dermatologist in New York City, by Allure magazine “Residue, dead skin cells, and oil colonize the brush and can be a nidus for bacteria and yeast, which in general is not good and can smell unpleasant.” Also by cleaning out your hair brush, you can get rid of dead hair build up, which helps wear on the brush bristles. Now I want to hear from you. How often do you wash your makeup tools? Do you have any tricks to cleaning these tools? What is your favorite makeup brush cleanser? Sound off in the comments on what I should try and do to help me get in the swing of constantly cleaning these tools. If it seems that Serena Williams is on a winning streak, by all accounts, that would be correct. In between giving birth, getting married, and her regular schedule as one of the greatest athletes of all time, Williams just staked her claim in the beauty world. Going off of recently found trademark documents, you can expect to see makeup, hair, and body products from her line. As TMZ first spotted, Williams filed legal documents to trademark “Aneres” (Serena spelled backwards) in January. She locked down the Aneres name for 18 beauty categories, among them lipstick, lip gloss, eyeshadow, powder, foundation, eyeliner, mascara, makeup remover, skin care, perfume, body lotion, shampoo, dry shampoo, hair rinses, hair spray and gel, cosmetics cases, and makeup brushes. The tennis star has yet to comment or post directly on her new venture but various twitter users commented their thoughts and feelings about Williams venturing into the beauty industry. Personally, I am very excited to watch Williams business ventures grow and reach into the beauty industry. Now I want to hear from you. What do you think of her moving into such a competitive industry and what are your expectations from this line? Comment below your thoughts and feelings. Now that february is over we can sit back, relax and talk about all things beauty that missed the mark in my eyes. I tried many different products this past month and while many were a success, there were two that sadly disappointed me. I am not the only one feeling this way too, users of these products wrote their reviews online and are feeling the same way I am. with this brand. Personally I like to buy higher end beauty product because I am a firm believer that you get what you pay for. According to elfcosmetics.com, the primer transforms your face into a flawless, smooth canvas ideal for long-lasting makeup application and is infused with Tea Tree and Vitamins A & E for restorative benefits. When first applying this primer to the skin it feels greasy and made it very difficult to blend out my foundation and concealer without making it look streaky. A review on ELF’s website states “This primer feels super greasy and heavy. It did nothing for my pores and didn’t keep my face from getting oily. I wish this primer was better”. I too wish this primer was better because I was excited to try more products from ELF, but this might just have changed my mind. favorite brands for cosmetics. Tarte are leaders in the beauty industry, offering eco-chic, cruelty-free cosmetics & hypoallergenic, vegan skincare. I loved how this moisturizer was hypoallergenic but that does not cover up its downfalls. 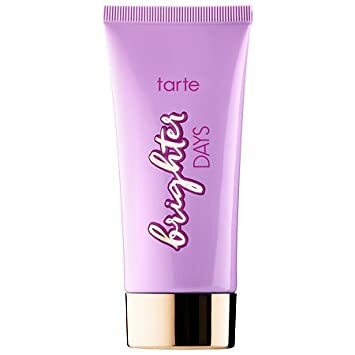 Tartecosmetics.com says that this will “give skin a natural glow from your daily moisturizer. This lightweight facial lotion formulated with 70% water & light-reflecting mineral pigments quenches dull, dehydrated skin while delivering a sheer veil of illumination & radiance.” When first applied it gives you a massive glowy skin complexion so if you have oily skin you might want to stray away from this product now. Since an upcoming beauty spring trend is a “glow from within” look I was hoping that when applied before foundation it would stay glowy and make me look radiant all day. I was sadly mistaken when I applied my foundation and there was no glow. Others who have used this product feel the same way stating ” I don’t feel I get that “glow from within” look.” in the product reviews. I will continue to try Tarte cosmetics but when it comes to skincare I am more hesitant. Overall I was expecting more from these products. If you have tried either the ELF primer or the Tarte moisturizer how do you feel about them? Let me know in the comments what your thoughts are and if you have any favorites from these brands that you think will change my mind! I don’t know about you, but I am DONE with this cold, dry weather that does nothing than dry out my skin. NorthEast Ohio is out to smack everyone with this freezing weather and is looking to chap any bare skin left out in the cold. Thankfully for Christmas this past December, my sister Leah sent me two products from First Aid Beauty that I now use every single day. The first product that I am absolutely in love with is the First Aid Beauty Ultra Repair Cream. I have dry spots on my arms, and I put one little dollop of this cream on them and boom, it makes my arms feel so smooth and comfortable. Their website states that this is a head-to-toe moisturizer that provides instant relief and long-term hydration for dry, distressed skin, even eczema. Even eczema people, thats amazing! The texture is almost like a soft whipped butter, and is instantly absorbed by the skin, with no greasy after-feel. This product is non-scented and alcohol free making it perfect for all skin types. First Aid Beauty also put in their work on this product, making it Allergy-Tested, Gluten-Free, Nut-Free, Soy-Free, Suitable for Sensitive Skin, and Vegan. The next First Aid Beauty product that I have been using almost everyday, is the Ultra Repair Lip Therapy. This is a nourishing lip treatment that helps hydrate, nourish and protect the lips. I use this product mostly before bed and under lipstick. when using it before bed, I sleep with it on and wash it off in the morning. It leaves my lips feeling repaired and hydrated. I also use it under lipstick when I need that long lasting moisture throughout the day. Its ingredients include oat flower and Shea butter to ward off harsh environmental aggressors like wind and cold temperatures. Overall I thought these products worked wonders, and I am excited to try more of First Aid Beauty. Like I said earlier, I received these two products together as a gift from my sister, but they are sold in retailers like Sephora. If I were you I would definitely give theses a try, and keep your skin safe this winter!